Breakfast is my favorite meal of the day; and while eggs and egg whites are considered one of the most perfect bodybuilding foods, they get old for me. Let me introduce you to some of my favorite foods, recipes and websites! Mr. Breakfast is THE place to go for figuring out what to eat when you have no idea what to cook. 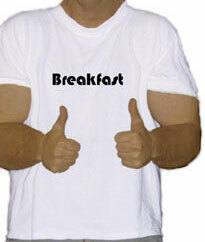 There is a HUGE database of ideas, recipes and even reviews of breakfasts restaurants! Omlettes, scrambles, French Toast and pancakes. If you don’t get this woman’s newsletter, you should! She is on board the Weight Watcher’s Train, and while I don’t care about WW, I love getting healthified recipes in my inbox all the time. The woman has even come up with an idea of how to make chocolate fudge from pumpkin! I don’t agree with all of her swaps (she uses lots of un-natural things, like fat free items, etc. flavored with artificial flavors and colors) however, for the ocassional craving that arises but you can’t bring yourself to succumb, she offers some great swaps! Here’s one for a Blizzard that looks yummy, great idea for PWO meal! Like I said, I’m getting tired of having oatmeal and eggs every morning, even though I LOVE both of them, especially oatmeal. I’ve been eating a lot of breakfast sandwiches lately, fritattas and scrambles. Let me introduce you to some of the ingredients I’m really digging, that help me get my protein in at breakfast without resorting to a dozen egg whites or protein powder. THIS is some fabulous stuff! I used to go for the Jennie-O turkey bacon, until I found this wonderful stuff. It has a deep, smokey flavor, and ZERO nitrates or fillers. If you can pronounce all the ingredients, you know you have good stuff. They’ve also got an organic version and lots of other products including deli meats, sausages and hotdogs. This stuff comes in all flavors, brands and varieties. I like this Al Fresco brand, but since it’s usually pretty expensive, I hit up Trader Joe’s for their store brand any time I can. Right now I have their Sweet Apple Chicken Sausage and bell pepper sausage. The mango sausage isn’t bad either. Al Fresco actually has a blueberry sausage, and man, does that sound good with some french toast! Something to watch out for though is fat and carb content. When picking your proteins, try to keep them just protein with low amounts of the former. While it’s ok to have higher fat content in your meats, it basically means you get less fat at other meals. Not as much fun, because the fat adds up fast! Alas, I have no pictures of these wonderful breads, but let me tell you, they both make WONDERFUL French Toast, for which the recipes are at the bottom of the page. The TJ bread is amazing, with only 60 calories, 5g protein and 7 grams of carbs per slice! AMAZING! And when you sprout the grains in the bread, this actually increases the nutritional value of the bread. Something sweet (usually a local honey). We believe bread is best when you keep it simple. It’s even better when you use the highest quality ingredients you can find. You can taste it and your body benefits from it. Just like fresh-ground coffee beans make a better cup of coffee, fresh-ground grains of wheat make a better tasting – and better for you – loaf of bread. Mix eggs and liquids together, dip bread in mixture and fry in pan. Slater on 1 Tablespoon of Philadelphia fat free cream cheese, peanut or almond butter (or flavored peanut butter, check out http://www.ilovepeanutbutter.com ) and/or fruit, make into a sandwich, dip sandwich into mixture and fry. There are so many versions of this. So pick your ingredients and here is the method for making them. Sautee veggies (with or without oil). As the eggs begin to set, lift up edges and let the runny parts run underneath. Top with meat and/or cheese. When it is almost set, throw the pan under the broiler for a few minutes. Take out when it’s golden brown and bubbly on top!